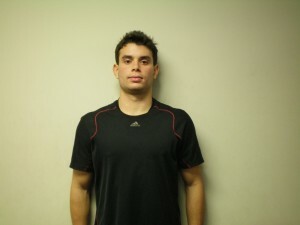 The 56th Member of the Soccer Fitness 20 MPH Club, Louis successfully completed 2 separate, 4-second running bouts at a speed of exactly 20 miles per hour, on Tuesday, December 6, 2011. Less than one month later, on Wednesday, December 28th, Louis improved his maximal running speed to an impressive 26 miles per hour, making him the 3rd FASTEST EVER ATHLETE AT OUR CENTRE! A Canadian born midfielder, presently playing with the reserve team of Flamengo FC, of the Brazilian first division, Louis has been playing professional soccer in Brazil for the past 3 years. His feat is even more impressive considering he ran 20 miles per hour in his very first overspeed training session at the Soccer Fitness Training Centre. We are looking forward to continuing to work with Louis in preparation for the 2012 outdoor season.